Use the Cloud 14A or 14B for your lighter components and get the same great results as with heavier components get on the Cloud 10 and 11! ingko Audio is extremely excited to announce the introduction of the new Cloud 14, designed specifically for lighter turntables and other lighter equipment. We have sold thousands of Clouds and their performance is undisputable. But as you know, the balls used in the Cloud are designed to work optimally under a load of 10 lbs per ball. As a minimum of 3 balls are needed under the top plate, an ideal load is an audio component weighing 30 lbs. Unfortunately, many components, notably entry level turntables made by Rega, Music Hall, Project, etc., weigh less than 30 lbs. To compress the balls properly, it is best to add more weight to the component before putting them on the Cloud. This is where the new Cloud 14 fits the bill. The Cloud 14 has a heavier top plate, with the added weight being a wood insert under the top surface. The combination of the added weight and the constrained layers of wood and acrylic results in the best performance for equipment weighing less than 30 lbs. Our lab tests and listening tests confirm the results and a new product is born. But don't take our word for it. We have an expert review to back it up. In the March issue of The Absolute Sound (on newstands now), Paul Seydor reviews four budget turntables: the Music Hall MMF 2.2, the Project-1 Xpression III, the Rega P3-24, and the Nottingham Interspace Jr.. On a Side Bar, he reviews the Gingko Audio Cloud 11, and the new Cloud 14, now available through our dealers. Here are some direct quotes when he placed these turntables on the Gingko Cloud 11 and 14: "As I had wrapped up the survey with the Interspace, I started there, expecting little improvement, as its isolation already seemed so good. Less than a minute into Kind of Blue, I was picking my jaw off the floor. The improvement was staggering: in the bass alone, greater clarity, definition, detail, pitch stability, and dynamic range. Removing the Cloud resulted in an undifferentiated wodge, thick, phlegmatic, and mushy. The Bernstein Carmen was even more revelatory: greater clarity and control all across the band and up and down the scale, far greater inner detail and imaging stability, an overall presentation smoother, more natural and relaxed." "Inasmuch as the Interspace was less excited by external disturbances to start with, I expected I'd hear even more dramatic improvements with the lower priced turntables. Not so. There was still improvement aplenty, but not to the degree I expected. Then I remembered that the MMF, Xpression, and Rega setups are all too lightweight to work optimally with the 11. 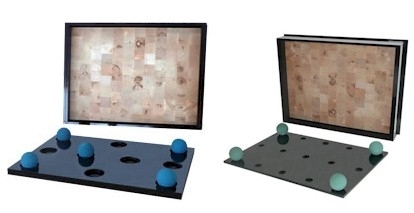 Using three balls in a triangular configuration-the minimum possible-requires a 30 pound component, which leaves the Rega ten pounds shy, the other two more than that. Vu then shipped two prototypes soon to go into production: the Cloud 14B ($499) and the Cloud 14A ($599), both of which have wooden inlays to increase weight, while the 14A also boasts a thicker, heavier platform. This was more like it, a substantial improvement along the lines discussed so far, and it gets better as the platforms get heavier. The 14A also brought a noticeable increase in definition of texture as well as of pitch. A non audiophile friend happened to stop by and I asked him to listen. His words: off the Cloud "the bass sounds bigger but very indistinct, almost watery"; on the Cloud, "it's tighter, and everything else sounds more precise-cleaner." "The bottom line? With loud playback levels and/or big, demanding music, especially in the bass, the effect of taking any of these four turntables off the Gingko platforms is to make it seem almost as if they're all literally broken." "Is it worth adding a Gingko to a turntable like the MMF, which more than doubles the cost of the setup? It seems an absurd proposition, I grant, yet the improvements are more audible than what you will hear most accessory products, including cables, interconnects, line conditioners, cones, pods, pucks, mats, clamps, weights, yak, yak, yak. But, hey, you can answer the question yourself, thanks to Gingko's 30 day money back guarantee, to which I'll add a guarantee of my own: put on Kind of Blue at a healthy level and listen for thirty seconds-the difference will be loud and clear in all senses of those words. The pun is as unavoidable as it may be egregious, but the ball's now in your court." Paul Seydor, The Absolute Sound, March 2009 There you have it. An introduction of a new Gingko product, accompanied by a glowing endorsement from a major print magazine. The Cloud 14 comes in 2 flavors, Cloud 14 A and Cloud 14B. They have the same heavier top plate with wood insert, but the Cloud 14A has the heavier bottom base of the Cloud 11 and the Cloud 14B has the single-layer bottom base similar to the Cloud 10. To accommodate the different size equipment, the Cloud 14 will have the same top dimensions as the Cloud 11L or Cloud 10L (for VPI Scout/Scoutmaster), 20.5" x 15". But at 4" high, it is taller than the 10 or 11, due to the wood insert. This document has been edited with the instant web content composer. The online instant HTML editor tools make a great resource that will help you a lot in your work. Save this link or add it to your bookmarks.